In the next release of Laserfiche Workflow, new charts, statistics and data let you monitor how quickly workflows and business processes are running, who is involved in them, where their slowest points are and more. Armed with this information, you can refine each step in your process so that your organization can run at optimal efficiency. 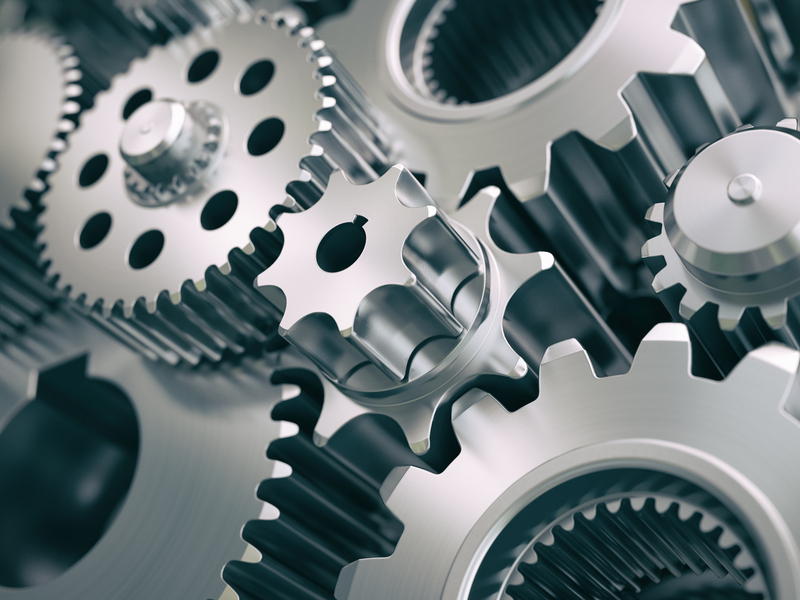 Each time a business process runs, the new Details tab displays statistics about the overall process and about each specific step in the process. Handy charts show you which steps in the process take the most time and if each step ran faster or slower than average. Additionally, this tab presents specific details about each step such as the step’s name, its start and end date, the due date for the step, its instructions or resolution (as relevant), users or groups who participated in the step and how long it took each participant to complete his or her assigned task. 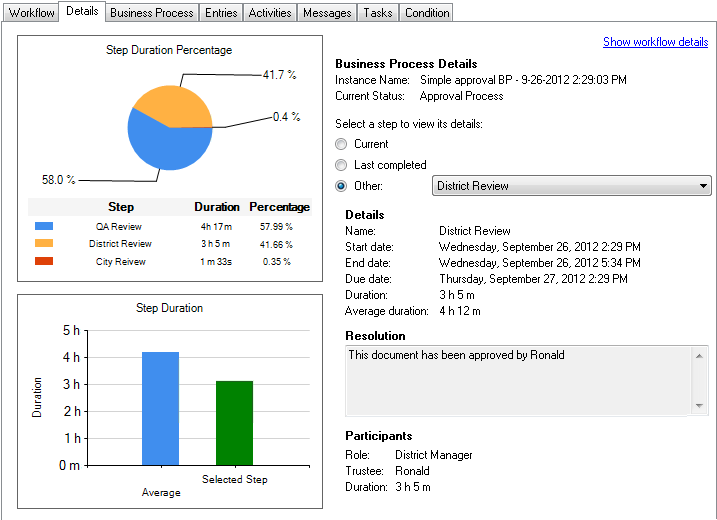 In this example, the District Review step is selected, and we can see that Ronald completed the step faster than average. The pie graph shows that the QA Review step took the longest, so we might want to select that step next from the drop-down menu to see its details. 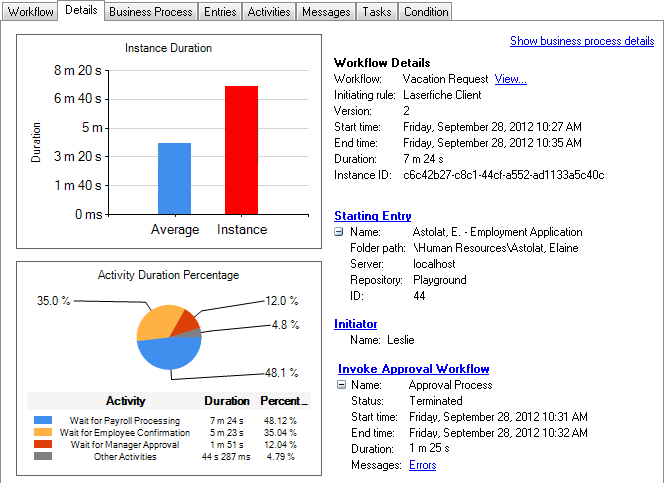 The workflow reporting details are available for both business processes and workflows. These details show how long it took for this specific process or workflow to run compared to the process or workflow’s average. They also provide information about the starting entry, starting event, initiator, each workflow that has been invoked from this instance and which workflow invoked the current workflow (if applicable). A chart reveals which activities took a long time to run and which ran quickly. In this example, when Leslie started the Vacation Request workflow on Friday morning, it took longer than usual to run. If we look at the various activities in the pie chart, we can see that the Payroll Processing took the most time, followed by the Employee Confirmation. We can also see that this workflow invoked the Approval Workflow, which ran very quickly.